The two most iconic animals of the West are the horse followed by the bison. I think the bison were also created for sculpture. Once numbering in the millions, they have come back from the brink of extinction and are thriving. Here is a case where man caused the problem, but then became the solution. Bison are big and powerful. 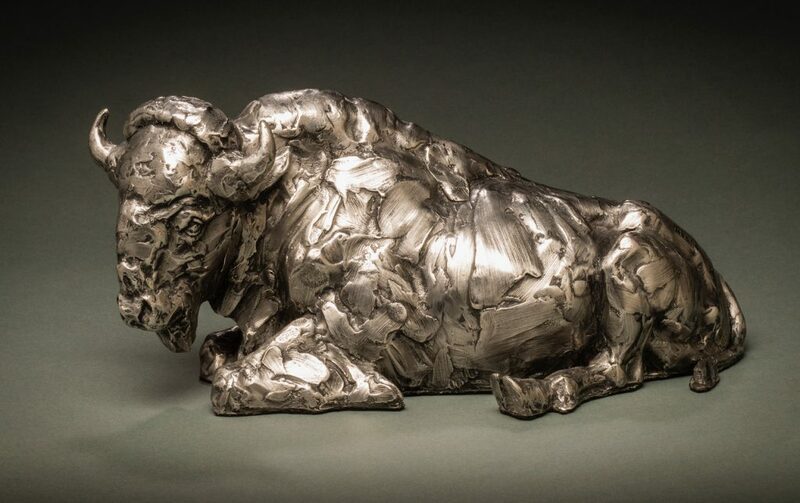 This sculpture depicts the bison in a moment of relaxation as he takes in the sights and smells around him. These animals travel many miles as they graze and move from place to place in herds. Bulls bicker over cows. Calves play under the watchful eye of their mothers. All the while they are wary, looking for threats that might be coming near. In an animal with so much hair, the simple, not overworked treatment gets the point across. The viewer is invited to touch. Imagine an opportunity to pet a bison. Whether in bronze or stainless steel, this big boy will remind you to take a little “Bison Break Time”!